A federated organisation may have multiple distinct services (service providers) where each service is protected under a distinct trust domain. The same organisation may wish to trust multiple external & internal identity providers and allow the end user to select their preferred identity provider. Furthermore the same federated organisation may require greater levels of certainty for specific services and may wish to limit the available identity providers for a specific service or enforce step-up authentication on the identity provider. This pattern is useful for governments and enterprise’s wishing to move away from a Push Model for Enterprise Identity Architecture. 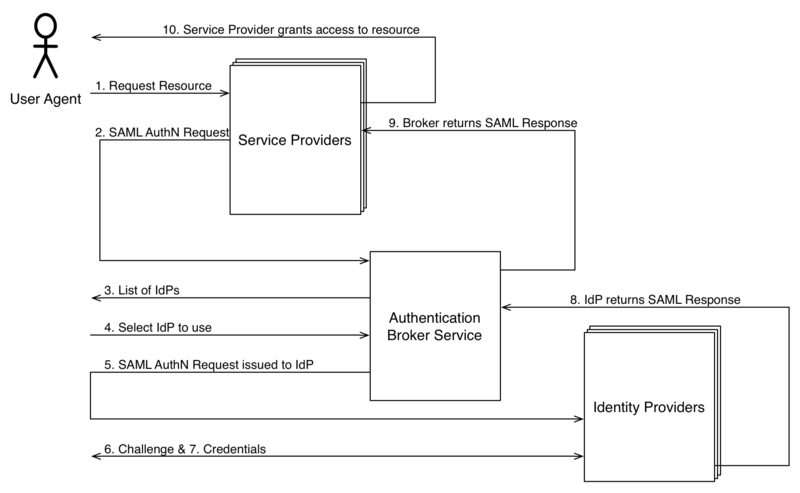 Note a slightly different pattern would be to pass a reference to a SAML artefact between the Broker and the SP. This would use the <saml:ArtifactResolve> element in the message passed back from the Identity Provider. This pattern would require a direct service between the SP and the IdP to resolve the attributes in the artefact. This pattern extension is only recommended when the authentication request can be deferred when multiple profile attributes are required from the identity provider.